Like both Monterey and San Francisco, Charleston is home to restaurants serving fresh local seafood. Just as in both of those cities there are good places to go and bad places to go. One of the places I would not recommend is the Noisy Oyster on Market at East Bay. 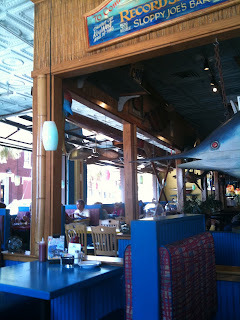 While the restaurant looked enticing, with its large open windows and kitschy fishing decor, the food was not as good. All of the fish served on the menu was on the Seafood Watch "avoid" list. I guess the local catches are not necessarily the best option. Also, the restaurant didn't really have any vegetarian choices. On the other hand, I definitely recommend Slightly North of Broad (SNOB). This restaurant is on of Charleston's best. It was so good, I ate there twice. 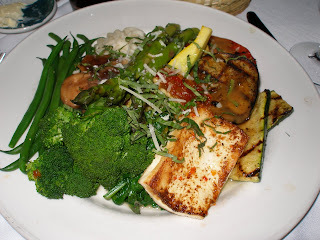 They had the best vegetable plate I've ever had and the items on the plate were all prepared perfectly. 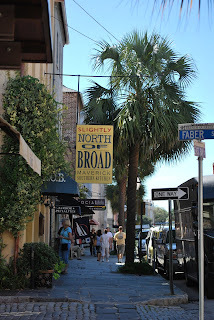 The restaurant is located on East Bay just down from Market Street and is one of many dining choices in that area. The SNOB building has a nice ambiance as it is located in a 19th century brick warehouse. The restaurant features an open kitchen with a large chef's table located right outside of the kitchen Slightly North of Broad uses fresh local ingredients and is a modern twist on traditional Low Country cooking. The BF had the prime rib dinner special on Tuesday and said it was the best prime rib he'd ever had. The second time we ate there he had the rack of lamb and, once again, said it was the best ever. The BEST veggie plate ever! One of the other restaurants I ate at was T-Bonz Gill & Grill on N. Market Street. It is part of a small regional chain, which I didn't know at the time. The food was decent, but the building it was located in was even better, being an old brick building with open beams. The East Bay Deli (on East Bay) is in a little strip mall, so is definitely away from the typical tourist stops in Charleston; however, it is definitely worth the visit. I had a fantastic veggie wrap sandwich as they have a very vegetarian-friendly menu. Judging by the lunch crowd, it is a popular spot with the locals. Unfortunately, I did not have enough time to try any of the other great restaurants in Charleston, but two locals recommended Basil as the best Thai restaurant in Charleston. I only wish I had been able to eat there.